The WSU mechanical engineering program at WSU Everett is a two-year, full-time bachelor’s degree completion program for transfer students. Most courses are taught in person by WSU faculty in Everett, and additional courses are taught via interactive video from WSU Pullman, or online through the University’s nationally ranked Global Campus program. The WSU mechanical engineering program at WSU Everett is an extension of the ABET-accredited mechanical engineering program at WSU Pullman. Mechanical engineers are in high demand. Firms in King, Snohomish, Island, Skagit and Whatcom counties, as well as the Puget Sound Naval Shipyard and Intermediate Maintenance Facility in Bremerton, employ mechanical engineers—and WSU engineering degrees are highly regarded. The WSU mechanical engineering program at WSU Everett gives you the scientific and technical foundation you need to be a mechanical engineer in virtually any industry. Students often have several job offers to choose from when they graduate. To be eligible for the WSU mechanical engineering degree program, you will need to complete the Program Acceptance Requirements. Apply for admission to WSU Everett as a transfer student. 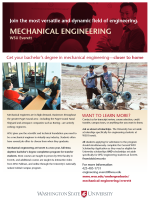 The WSU mechanical engineering program at WSU Everett accepts entering students for fall semester only. APPLY using the Transfer Student Application. Select “North Puget Sound in Everett” as your campus and “Mech Eng” as your academic interest. Transfer Student Application. WSU Pullman students who wish to transfer: scroll to the bottom of this page. Complete the mechanical engineering supplemental application. The academic coordinator will review your supplemental application and transcript(s) for prerequisites to acceptance/certification into the mechanical engineering program and contact you for next steps. NOTE: The WSU tuition deposit, which confirms acceptance of your WSU admission offer, is nonrefundable; pay the deposit only after you are accepted/certified into the mechanical engineering program. WSU Application and Supplemental Application close March 30. All students must meet requirements as outlined in the WSU Catalog in order to graduate. See the WSU Catalog for degree requirements and talk with your academic adviser about planning and scheduling your courses. Students who are currently certified in the ME major in Pullman should contact the academic coordinator in Everett to determine feasibility and eligibility. GPA is a consideration as is completion of the same prerequisites as all other transfer applicants. Evaluation of coursework still needed to complete the degree vs. the schedule of courses offered is another consideration. Do not complete a Change of Campus Form until it has been determined that there is space, prerequisites are satisfied, and that the schedule of courses in Everett will allow timely completion of your degree. Students who are not yet certified should check that all prerequisites are completed (or will be completed prior to the desired start term). Students must complete the supplemental application and compete in the general pool of applicants. Contact the academic coordinator in Pullman with any questions. Do not complete a Change of Campus Form until you are accepted into the Everett program. Scholarships and other opportunities are available to help students finance their college education. Learn more. Prospective students, on-site advisor for students accepted to program.